The libary's Takeovers involve crafts, video games, Nerf games, and more — all while the library is closed. Each Takeover event is tailored to a specifc age group (either tweens, teens, or adults) and people from outside that age group are not permitted in the library during the event. The events enrich participants’ lives through social interaction and play. The events are intrinsically exciting and they give the specifc age group targeted a sense of ownership of the library space. The events encourage exploration by bringing many brand new people to the library and introducing them to a range of activities available in our space. Though these events can feel chaotic, the excitement and energy of everyone involved in Takeovers is uplifting, thrilling, and completely different from what we typically see at library events. 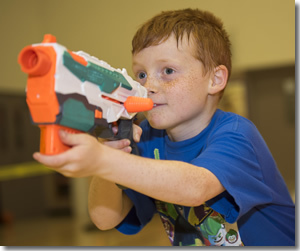 Ripon Public Library has been hosting Nerf Battles since March 2016, and they have both Teens Only (ages12-17) and Adults-only (ages 18+) events on the calendar for this summer.